Cold Spring Harbor, NY — Of the 250,000 American men who will be diagnosed with prostate cancer this year, very few of them—about 1 percent—will develop lethal, metastatic disease. Finding a way to distinguish between this small cohort and the majority of patients who will develop an indolent, non-lethal form of prostate cancer is a key goal in prostate cancer research. Cold Spring Harbor Laboratory (CSHL) scientists have taken a major step towards this goal by identifying a new prostate tumor suppressor gene called PHLPP1 (pronounced FLIP or FILIP) and showing that it acts in concert with PTEN, a well-studied tumor suppressor that is mutated in roughly half of prostate cancer patients. In a study appearing in Cancer Cell on August 16, the scientists define the relationship between the two genes, showing how their individual or simultaneous loss impacts cancer progression and development of lethal disease. PTEN’s role in prostate cancer has been relatively well characterized in mouse models that faithfully mimic human disease. 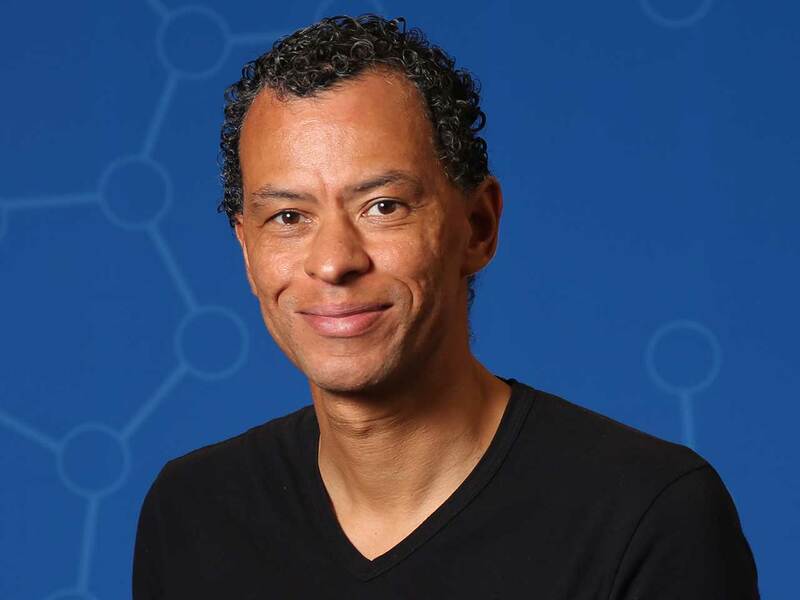 These models, several of which had been previously developed by the study’s leader, CSHL Assistant Professor Lloyd Trotman, Ph.D., revealed a surprising insight about this gene. Unlike most tumor suppressor genes, which allow cancer to occur when both their copies stop working or are deleted, the loss of one copy of PTEN results in tumor formation, while paradoxically, the loss of both copies triggers cells to undergo senescence, a potent form of growth arrest that blocks development of cancer. Cells overcome this fail-safe mechanism and give rise to prostate cancer only when another gene, the “master” tumor suppressor P53, also happens to get disabled by mutations. “This discovery, which suggests that cancer develops by navigating around such cellular roadblocks, led us to ask whether there are specific rules for prostate cancers to become lethal,” explains Trotman. “We wondered what kind of gene deletions work together with PTEN-loss to trigger cancer, or which of them trigger fail-safe mechanisms.” So his team began to examine other known components of the molecular pathway that PTEN acts on to keep prostate cancer in check. The PTEN protein, which is a type of enzyme known as a phosphatase and works by removing phosphate molecules from its molecular targets, tempers prostate cell proliferation by preventing activation of a cancer-causing gene, or oncogene, called AKT. Focusing on another phosphatase, PHLPP1, which had been recently identified as a de-activator of AKT, the CSHL scientists showed that the PHLPP1 gene also functions as a suppressor of prostate tumors. 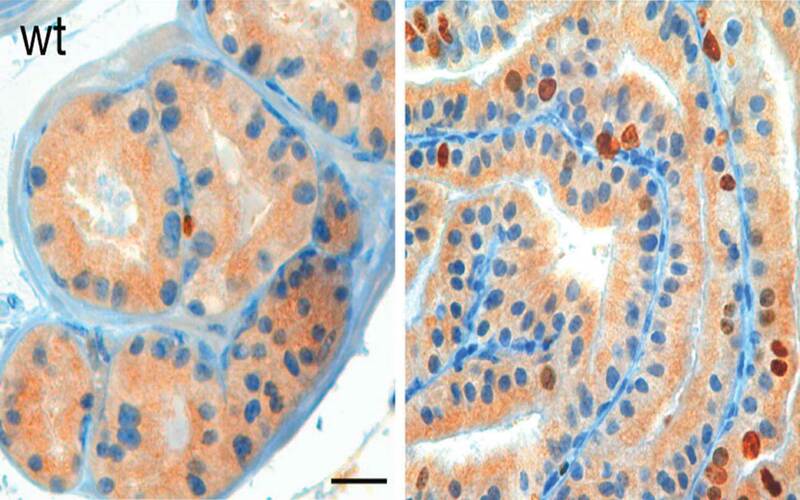 Mice that lacked both copies of Phlpp1 developed a pre-malignant form of prostate cancer. The relationship between PTEN and PHLPP1 became apparent when the scientists bred mice that were PTEN-deficient and also lacked Phlpp1. The combined loss of both genes resulted in excessive Akt activity, which in turn activated the p53-driven fail-safe mechanism leading to senescence. Although this response delayed the progression of disease, the fail-safe mechanism was eventually overcome in the prostates of the mice after the spontaneous inactivation of p53. “Breaking this p53-driven senescence was the key requirement for disease progression in the mice,” explains Trotman. To find out if and when this event actually occurs during the course of human disease, they teamed up with a group of clinical scientists led by the late Dr. William Gerald, M.D., Ph.D., and Dr. Brett Carver, M.D., at Memorial Sloan Kettering Cancer Center who had just defined the genomic landscape of more than 200 human prostate tumor samples (primary and metastatic). The collaborators found that while virtually none of the primary cancers had dual deletions of PHLPP1 and PTEN, both genes were very frequently co-deleted in metastatic tumors along with P53 and PHLPP2, a gene closely related to PHLPP1. The team has found that monitoring the transcription activity of these two genes—the extent to which they are switched “on”—following prostate surgery could predict whether a patient is on a trajectory to developing these dangerous dual deletions and relapse from hormone therapy. “This information could greatly help identify the best candidate patients for clinical trials with PI-3kinase/AKT pathway inhibitors”, says Trotman. This work was supported by grants from the Department of the Army, the Starr Foundation, the V Foundation, the V Kann Rasmussen Foundation, the National Institutes of Health, MSKCC Prostate SPORE, David H. Koch, and the Rita Allen Foundation. “Identification of PHLPP1 as a Tumor Suppressor Reveals the Role of Feedback Activation in PTEN-Mutant Prostate Cancer Progression,” appears in Cancer Cell on August 16. The full citation is: Muhan Chen, Christopher P. Pratt, Martha E. Zeeman, Nikolaus Schultz, Barry S. Taylor, Audrey O’Neill, Mireia Castillo-Martin, Dawid G. Nowak, Adam Naguib, Danielle M. Grace, Jernej Murn, Nick Navin, Gurinder S. Atwal, Chris Sander, William L. Gerald, Carlos Cordon-Cardo, Alexandra C. Newton, Brett S. Carver, and Lloyd C. Trotman. The paper can be downloaded at http://www.cell.com/cancer-cell/ using the doi: 10.1016/j.ccr.2011.07.013.